As part of my New Year’s resolutions, I wanted to cook one vegan/vegetarian meal a week. This resolution has been so much easier to keep than I thought, thanks to my friend Denise. She was so kind and gave me a copy of one of her favorite cookbooks: Veganomicon. I flipped through this book at least three times when I first got it. The more I familiarized myself with the recipes, the more excited I became. The recipes sound so good, and use real ingredients. 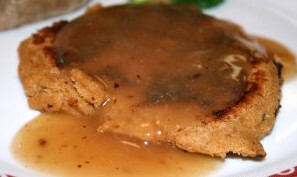 Of course some of the recipes have tofu or seitan in them, but many do not contain either. This excited me. I have decided to share our meatless meals with all of you.Â Every Monday I will post a meatless recipe. I hope you will give them a try. The first recipe I tried was the Chickpea Cutlets. Mainly because I had all the ingredients on hand (or so I thought), and because I thought I would serve them covered in gravy (everything is better with gravy, right?) like a chicken-fried steak. For starters, the recipe calls for vital wheat gluten, I misread it and thought I needed wheat germ. I am sure the texture of my cutlets were different than what the recipe would have produced. I just doubled the breadcrumbs instead of adding wheat gluten. I will try this recipe again, once I get some vital wheat gluten. I served these with a baked potato and blanched broccoli. We did such a good job of having a vegan dinner until we slammed that glass of ice cold milk. OOPS! The authors say you can bake these in a 375 degree oven for 20 minutes, turning once after 10 minutes. Make sure to lightly oil each side of the cutlet. Mash together chickpeas and olive oil, until there are no whole peas. Put in mixing bowl, add all the other ingredients and knead for 3 minutes, until strings of gluten have formed. Preheat cast iron skillet over medium heat. Divide dough into four equal parts, knead each cutlet in your hand for a few minutes and flatten to a 6 x 4 rectangular cutlet shape. Add a thin layer of olive oil to skillet, cooking cutlets about 6 minutes on each side. Add more oil if needed when you flip them. They should have a nice golden brown color and firm to the touch. Stir corn starch into the broth. Add broth to skillet, scraping up any cutlet bits stuck to the bottom of the pan (I had some). Whisk gravy until it had thickened. Serve over cutlets. ENJOY! I haven’t tried those because obviously there is no wheat gluten in our house! I thought they sounded yummy though. We are having “Snobby Joes” out of Veganomicon tonight… yum! I haven’t bought Veganomicon yet (I have her first cookbook, Vegan with a Vengeance), but these look yummy. We also like the “Snobby Joes” (I got the recipe off the PPK website).